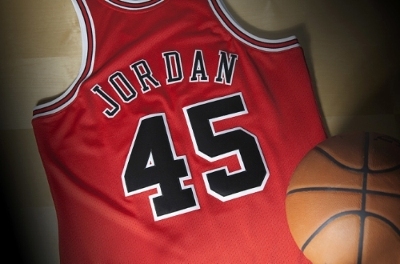 This March, Mitchell & Ness as part of their ongoing partnership with Michael Jordan and the Jordan brand, will release Michael Jordan’s Chicago Bulls jersey number 45. Retailing at $300, the March 19, 2015product release marks the 20th anniversary of Jordan’s return to the NBA and the court, wearing the number he also wore while playing for minor league baseball team the Birmingham Barons. Michael Jordan’s legendary number 23 with the Chicago Bulls was retired by the Bulls on November 1, 1994. On March 18, 1995, Jordan announced his return to the game with a two-word press release simply stating “I’m back”. This announcement came one and a half years following his retirement from the game of basketball on October 6, 1993. Jordan’s return debut was against the Pacers in Indiana with Jordan finishing the game with 19 points, 6 rebounds and 6 assists. Mitchell & Ness is the exclusive maker of NBA Michael Jordan jerseys from the Spring 2014 through the Fall | Holiday 2016 seasons. Mitchell & Ness has chosen a select series to celebrate key anniversaries of signature, career-defining MJ moments, and the historic moment of MJ’s return to the game as number 45 on the Bulls, a highlighted moment in MJ’s career. Mitchell & Ness continues to drive athletic apparel trends throughout the world. Shop the new Michael Jordan jersey at the Upper Deck Company, www.nbastore.com & NBA 5th Avenue store in New York, the Mitchell & Ness Flagship Store in Philadelphia, the Chicago Bulls Team Store at the United Center, the Charlotte Hornets Team Store at the Time Warner Cable Arena, & the Basketball Hall of Fame in Springfield. Founded as a golf and tennis company in 1904, Mitchell & Ness Sporting Goods provided on-field uniforms to the Philadelphia Eagles, Athletics, and Phillies as early as 1933. The Mitchell & Ness Nostalgia Company was created in the 1980’s based on the idea to resurrect authentic jerseys significant to sports history. 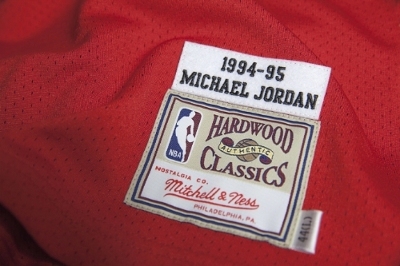 As the pioneer in this field, Mitchell & Ness is known worldwide for its authentic classic jerseys. The company holds licenses from the MLB, NBA, NFL, NHL and NCAA to produce premium apparel and headwear. Headquartered in Philadelphia, PA, Mitchell & Ness has been “Defining Authentic” for over 100 years. For more information on Mitchell & Ness, visit www.mitchellandness.com. To shop other styles and the full Mitchell & Ness collection, shop online at www.mitchellandness.com, visit the flagship at 1201 Chestnut Street in Philadelphia or find the closest authorized retailer at http://mitchellandness.com/retailer.aspx.